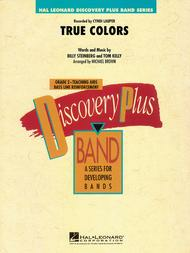 True Colors composed by Billy Steinberg and Tom Kelly. Arranged by Michael Brown. For Concert Band (Score & Parts). Discovery Plus Concert Band. Grade 2. Score and parts. Published by Hal Leonard (HL.8725274).This hauntingly beautiful ballad first recorded by Cyndi Lauper in 1986 has remained popular through the years, and was featured in the first season of the TV series Glee. A great-sounding change of pace that works well for band. True Colors composed by Billy Steinberg and Tom Kelly. Arranged by Mac Huff. For Choral (ShowTrax CD). Choral. CD only. 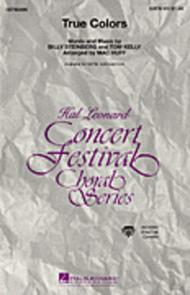 Published by Hal Leonard (HL.8740501).ISBN 1423477405. 5x5 inches.This beautiful song receives a truly special treatment by Mac Huff. 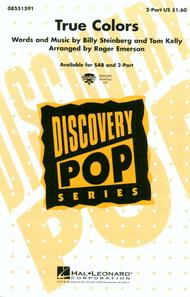 Available: SATB, SAB, SSA, ShowTrax Cassette. Performance Time: Approx. 4:30. True Colors by Cyndi Lauper, Phil Collins, Glee (TV Series), and Glee Cast. For piano and voice. Film/TV; Pop; Rock. PV. 5 pages. 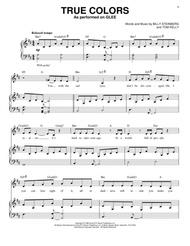 Published by Hal Leonard - Digital Sheet Music (HX.166385).About Digital Print Sheet MusicDigital Print is printable sheet music available anytime, anywhere. Just purchase, print and play! View your online sheet music at home, school, work or anywhere you have a computer connected to the Internet. Use our iPad app to view your digital sheet music on the go. With Digital Print, you can print your digital sheet music immediately after purchase, or wait until its convenient. And our software installation is easy - we'll guide you through the simple steps to make sure you have Adobe Flash Player, Adobe AIR and the Sheet Music Plus AIR application. True Colors by Cyndi Lauper. By Billy Steinberg and Tom Kelly. Arranged by Roger Emerson. 2-part. Discovery Choral. Choral. Pop Rock. Difficulty: medium. Octavo. Chord names. 8 pages. Published by Hal Leonard (HL.8551591).With chord names. Pop Rock. 6.8x10.5 inches.The 1986 #1 pop hit by Cyndi Lauper really speaks to the heart. Younger choirs will find much meaning in the sensitive text and will sound their best with this well-crafted Roger Emerson arrangement. Available for SAB and 2-Part. Performance Time: 3:15. True Colors by Cyndi Lauper and Phil Collins. By Tom Kelly and Billy Steinberg. Arranged by Deke Sharon. For SSA choir (SSA). A Cappella; Concert; Pop. Choral. 7 pages. Duration 2:30. 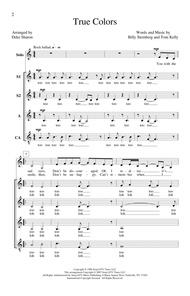 Published by Hal Leonard - Digital Sheet Music (HX.132723).About Digital Print Sheet MusicDigital Print is printable sheet music available anytime, anywhere. Just purchase, print and play! View your online sheet music at home, school, work or anywhere you have a computer connected to the Internet. Use our iPad app to view your digital sheet music on the go. With Digital Print, you can print your digital sheet music immediately after purchase, or wait until its convenient. And our software installation is easy - we'll guide you through the simple steps to make sure you have Adobe Flash Player, Adobe AIR and the Sheet Music Plus AIR application.